If you’ve visited more than one or two Amish settlements, you’ve probably at some point been struck by contrasts–sometimes stark differences. The most immediately obvious signs are material. Homes, buggies, clothing and other items tell stories about how the area’s residents choose to be Amish. 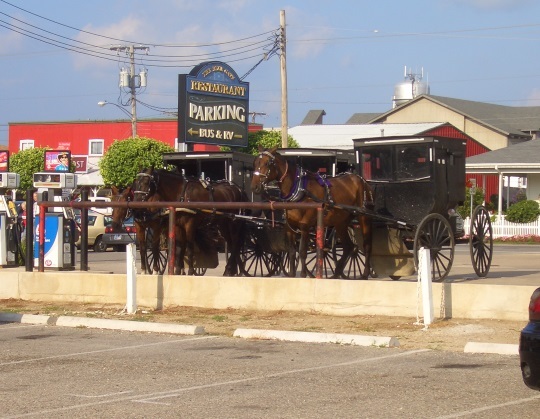 Today Jim Cates looks at those differences in Indiana’s two largest Amish communities–the Elkhart-Lagrange County area, whose best-known place is Shipshewana, and Adams County, centered around the town of Berne. I have a friend who refers to the Elkhart-LaGrange settlement as the “Flower Children of the Amish.” She is not derogatory. She is, shall we say, a colorful individual who enjoys embroidering her descriptions in memorable ways. She also lives in Fort Wayne, as do I. We are thus set almost equidistant between the settlements of Shipshewana and Berne, Indiana. And when compared to the Amish of Berne? The Amish of Shipshewana are radicals indeed. The discrepancies in lifestyle between these settlements occur because of the very different paths their founders took, both from Europe and in this country, to find their niche in what would then have been the Wild West (now the Midwest). However, this blog focuses on recent economic efforts between the two, as an example of the differing outlooks on prosperity that groups of Old Order Amish employ*. In contrast, ostentatious display of wealth in an Amish home would be apt to invite a visit from the deacon – and removal of the offending display. As Christians, their purpose here is not to amass worldly wealth, but to store treasure in heaven. In the words of Christ, “I say unto you, it is easier for a camel to go through the eye of a needle, than for a rich man to enter the kingdom of God” (Matthew 19:24). And yet, what constitutes “rich?” There are Amish families who have amassed several millions of dollars, while there are others who survive on the benevolence of the church. And just as is true in the broader society today, there are many more Amish families who tend toward a broad middle-class than toward the upper tier of financial security. Still, at what point does the scale tip to indicate “too much” money? And at what point does the display of amassed wealth take on the appearance of ostentation? Berne and Shipshewana are at the extremes of this puzzle. Both Old Order, Berne is a small, Swiss settlement. Theirs is a strict Ordnung, limiting technology. Many churches still forbid indoor plumbing. Their people abide by the expectation of the open buggy, and through each tumultuous Indiana season brave the weather. Their only concession to inclement conditions is the use of large black umbrellas. Their houses are neat, but decoration is limited. Instead, items there are more likely to be utilitarian. Lighting is accomplished through lamps, and the icebox is still present in most homes, with ice cut in the winter to tide the family through the spring and summer months. The same utilitarian approach is true of their schoolhouses. Items are designed to teach, with less emphasis on décor or lightening the atmosphere in the classroom. The spare feel to homes and schools is not all a product of the Ordnung however. Sufficiently rural to be bypassed by most tourists, and also sufficiently rural to have few opportunities for construction in the immediate area, commerce is limited. Men often drive several hours to and from job sites to find employment, and even then may have periods in which they struggle to find work. The recent economic downturn hit the Berne construction crews, as it did the rest of the country, and it has only been in the recent months that work has revived. Funds for anything more than essentials have thus been in short supply. In contrast are the Amish homes of Shipshewana and the nearby area. These are larger, well-kept buildings. More likely to have curb appeal with landscaping that includes ornate flower gardens and shrubs, they provide a sense of affluence. Indoor plumbing is the norm, and buggies are enclosed for greater comfort. Within the homes, furnishings are less utilitarian and more styled, while knickknacks, collectibles, and china adorn hutches and wall space. Homes may also include such labor-saving devices as washing machines, refrigerators, freezers, and battery-powered lamps. Schoolhouses are notable for the bright posters on the walls, and touches imparted by teachers to give cheer to the classrooms. While the Shipshewana area is arguably the most liberal in the Elkhart-LaGrange settlement, or “high Amish” with an Ordnung willing to embrace technology, the remainder of the settlement is also high Amish compared to the low Amish, or more conservative approach, of Berne. And what can be said about the differences in the way these Old Orders choose to live? We know that competition is fundamental to almost all living organisms (for example, longstanding research has found that a cockroach is actually quicker to negotiate a maze if it is running against another cockroach.) As humans a part of that “competitive edge” seems to be a desire to demonstrate our success. It is that hochmut, or pride, that the Amish resist. And yet, the competition to show success is relative to the standards of the community. Elkhart-LaGrange has the economic support of the trailer manufacturing industry, employing several hundred Amish workers (the economic downturn hit hard, but the industry is in recovery.) And tourism, while not as large an industry as Pennsylvania, continues to be a mainstay. Together, these areas of commerce boost the per capita Amish income in that settlement. “Pride” in possessions is thus not demonstrated if the large majority of homes have the same décor, labor-saving devices, and landscaping. Rather, it becomes a matter of staying in step with the community. In Berne, by contrast, there has been no such influx of commercial success to boost the median Amish income. Staying humble but in step – that is, appearing neither ostentatious nor poverty-stricken – then involves a much different set of expectations for the appearance of home and surroundings. The Amish there position themselves to meld into the group and remain similar to their neighbors, just as their cousins do in Shipshewana, approximately 100 miles north. And yet, the question persists: do the Amish succumb to the desire for money? That question is discussed in the next blog. *For a more thorough and scholarly analysis of cultural issues among the Amish, see Plain Diversity: Amish Culture and Identity by Steven M. Nolt and Thomas J. Meyers, 2007. For a better understanding of Indiana Amish see An Amish Patchwork: Indiana’s Old Orders in the Modern World, Thomas J. Meyers and Steven M. Nolt, 2007. I recently joined an MLM selling coffee. I was astonished to learn that many Amish have joined the same coffee company and are doing quite well at it. Not sure whether this is prophetic upcycling (swords into plowshares)or whether there was a Plain seamstress somewhere who made up customers’ own material – but I was certainly taken aback at first sight! In rural communities, camouflage is not exclusively or even primarily about military service, but about hunting. When camo is put on something one would never actually use while hunting, it is sort of a whimsical reminder of the pleasure of being afield. Thank you so much for this discerning article. I live in the edge of a Swiss settlement, started from some Berne Amish in the 1950’s to promote a less worldly lifestyle than the Berne group. So you can guess some of the rules for this group. I am about an hour from the Shipshe Amish, and my daughter lives nearby. She grew up with our Swiss Amish as friends, so to her the group around her now are “Show Amish.” She has friends among them and works directly with several of them, and gets along with them very well. But they never seem like “real” Amish to her after her experience with the Swiss. Cora, I’m curious where you live. Are you near the hamilton settlement? That is interesting, CoraVee. I guess non-Amish people living close to an Amish community get used to the local Amish ways then find another Amish community to be very different from what they see every day. It makes sense to me. We are used to most of our non-Amish neighbors being of Swiss background or Amish & Mennonite descent, so it can be interesting to see a different part of the country. 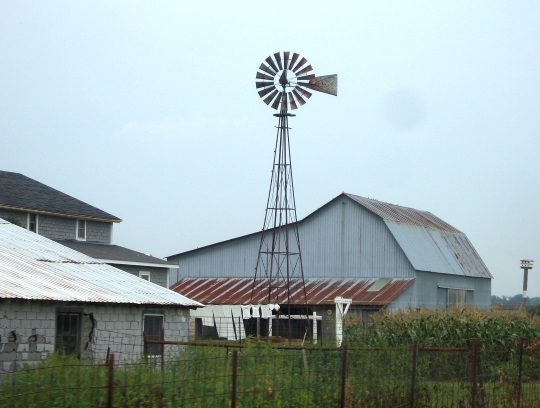 We were once in the southern part of the state and saw a lot of non-Amish homes & farms that looked very different from homes we are used to seeing and it seemed the culture was different, more laid-back, less touristy, less Swiss-German. It is always interesting to me how people live in other areas. Well written article. Thanks for sharing your insight into the differences between the communities. This is a very interesting article. Are there any photos of any E-Lagrange homes to accompany this article? I hear there are Amish suburbs out there but I could never find images anywhere. I would imagine these have popped up because farming just isn’t an option for some folks these days. Leilah it is true that there are suburb-type layouts in that community. You can do an image search using the box at the top of the page which might show some if we have any here on the site. On page 76 in Stephen Nolt and Thomas Meyers’ book, “An Amish Patchwork” there is a picture of an “Amish suburb” in the Elkhart-LaGrange settlement. On page 89 in Nolt and Meyers’ “Plain Diversity” there is a picture of a typical house with landscaping in the same settlement. These pictures are good, but I think you have to drive around the Shipshewana area to get a better feel of what is referred to as “Amish suburbs”. I really enjoyed today’s posting. Having been in both settlements several times, I think Cates’ descriptions are very good. I get the same feeling whenever I stop to visit friends in the conservative Paoli, Ind., settlement on my way to visit other friends in the Daviess Co., Ind., settlement (a distance of only about 35 miles). I think these contrasts are going to be even more evident in the future as some communities get more modern and some conservative and Swartzentruber communities remain much the same. By the way, I have found both of Nolt and Meyers’ books mentioned above to be good books if one wants to learn more about contrasts, and similarities, in these and other Indiana Amish communities. Satellite view with google maps can give you some idea of home distribution. Emma, Indiana is the approximate center of the community. 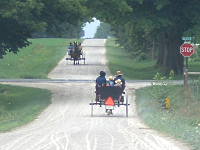 A typical Amish residence will have at least 3 acres of land, frequently 5 or more acres. So while the buildings are in close proximity, they are not as tightly packed as one might assume. There are exceptions and some areas are densely populated. Interesting article & comments. An unrelated subject: Erik, why do the recent articles & comments not show up on the Amish America home-page? I received this in e-mail but none of it shows up on the home-page when I go to it. I had the same problem. I go to the home page to see if there are any new articles. Recently new articles have not been at the top of the list and I leave the site assuming there is nothing new. I’m testing a few different caching plugins for speed purposes. I just checked and discovered that the home page was not updating due to a setting. I think I fixed it. It should show you the latest post (this one) at the top now. Is that what you’re seeing? Also, if I can ask since we’re on the subject, Mark I know you had noticed an issue with clicking on email comment notifications, and then the comment not being visible on the site. Have you noticed that lately, or are they there on the site when you click on the email link? Thanks for any feedback, want to make sure this is working properly. The speed gains will be worth it, but has to function well too. I am now seeing this article at the top of the list. Thank you! Thanks! If you happen to notice anything weird again, let me know if you don’t mind. I have to test one more speed plugin before I decide which one to use. But I’ll try to be aware of this issue. The problem seems to have been solved. Thanks, Erik! I had had trouble clicking on the new comment and having it disappear but it works okay today. Thanks again. I appreciate you letting me know Mark. Glad it’s working. Have to test one more still but hopefully the issue won’t return, just drop me a comment here if it does. Thanks! Rebecca do you mean the problem that the latest post wasn’t showing at the top of the main page, or that email notifications of comments weren’t working like they should? Thanks for letting me know. The latest post showing at the top. I often learn about the posts by my E-mail.Thanks ! I was down in Berne this weekend visiting some families with an older Amish friend who lives in one of the more conservative eastern districts here in Elkhart lagrange. On the way home he mentioned it would be “hard to adjust to living there.” One of the houses we visited had asphalt shingles for siding. He said if he “had a 16 year old daughter, my wife would have to change that.” He was implying that if he had a daughter nearing dating age, his wife would make him put vinyl siding on the house (ie. the singles wouldn’t do, they would have to have something nicer). To respond generally to several comments, I don’t want to give the impression that there is “a” way that things are done in Berne, and “a” way things are done in Elkhart-LaGrange. Berne is the much smaller settlement, but even there I know there is a debate these days about the merits of indoor plumbing, with some bishops allowing it, and others remaining staunchly determined it is too worldly. In Elkhart-LaGrange one can find “high Amish” with tech-savvy washers, refrigerators, freezers, and farm equipment in and around Shipshewana right next to an area locally known as “The Barrens,” a very “low Amish” area with church districts bordering on Berne’s lack of technology. Overall however, Berne is the more “low Amish” area. The biggest difference I’ve found? Amish cooking is fantastic anywhere, but the Elkhart-LaGrange women are leaning toward ready-made and prepared foods. I go to Berne to have fried chicken that was fresh (as in alive) that afternoon, and fruit pies made from scratch that keep me doing double exercise duty for the next week! I have a question for Mark, Erik, or anyone. I have noticed in less affluent communities such as around Coldwater, MI and Kokomo, IN, many of the Amish homes are not well maintained. They are in need of paint and often have a lot of “stuff” around the yard. Does this have to do with the lack of money or an attitude that this is not important? Harriet – I hope Mark, Erik, and others chime in as well, but I have heard Dr. Steve Nolt speak on this topic. He has commented that the Amish in the areas you mention as less well-kept see an emphasis on painting homes and houses and excess “upkeep” as prideful. Again, to amplify an earlier comment, you can see the same differences in Elkhart-LaGrange if you know where to look (e.g., Coldwater can be considered a part of that settlement). Interested in other’s views. Harriet, I think Jim said it very well. We are used to seeing most Amish homes in our area well kept, but see a difference between farmers & non-farmers and some differences between groups. For example the Swartzentruber Amish do not go in for landscaping as we like to and would not put vinyl or aluminum siding on their homes. I have seen smaller or more conservative communities where the thinking seems to be that putting too much time, effort, and expense on the appearance of your yard or home is prideful or wasteful. I can see what they mean by that, but on the other hand, those of us not farming enjoy spending time in the evening on yard work as a hobby and family activity, so it can be seen from different viewpoints. Thanks, Mark. I always appreciate your input since it is from someone “walking the walk”. What both you and Jim have said makes a lot of sense to me. I spent almost half of my life in the Kokomo area, and always wondered why their homes were more “sad looking” than other Amish communities. By contrast, most of the Mennonite homes are very well kept. Jim, there are some very low Amish in the Coldwater area. Some of the California Amish have been forced by land availability to move west, but still retain their ties to their old community. They do not even permit anything but the hand powered James washer for the women to use. My closest Amish friend told me that one of the differences in the neat, trim appearance near Ship is that that land has been in the possession of families of over 150 years, while ours is a relatively new settlement (50 years is new.) However she was upset to see the poor quality of some of the new construction here. She said, “You can see right through their walls.” And some truly are built by amateurs without a plan. But the California settlement does not allow men to work further than their buggy can take them. No hiring a driver. One group travels nearly 30 miles one way to work, I think on a dairy farm. Several guys in one buggy, sometimes two. This has made a distinct financial hardship. And they are not allowed to do any carpenter or other work inside town limits. Interesting, CoraVee. I think it’s the same issue with Nappanee. Depending on perspective, Napp is/is not part of the Elkhart-LaGrange settlement. And I’ve certainly heard Amish within what is clearly Elkhhart-LaGrange distant themselves from each other, based on differences in the Ordnung. Thanks for sharing CoraVee, interesting thread. Branch County has around 5 different communities, sounds like you are describing a Swartzentruber group. I believe I’ve been to this community you describe, and also a/the Swiss settlement in the county. There is a visible difference between those two groups. I am not sure what affiliation the other settlements in the county belong to. The Swartzentruber Amish tend to have low incomes compared to higher Amish, in part due to their restrictions on technology and also the buggying-distance stipulation. I think we’d be surprised by how little some of them get by on. It’s a very plain and simple life. There’s also an article on Amish wealth in the Holmes community which might be of interest (one of the authors is David McConnell, who co-authored An Amish Paradox and has been guest posting here). I know of an Amish business man who may only pay his Swartzentruber employees a certain amount (not very high), but then to be fair he will gift them with useful things like groceries, etc at Christmas or whenever. For them it is a way of trying to keep everyone more on the same level. When I was touring Shipshe a couple of years ago, we stopped for lunch at an Amish home that was beautifully maintained & landscaped & looked as “suburban” as most Englisch suburban homes. Of course, serving meals to bus tours is their business, so maybe that’s why (we ate in a very neat, clean, large, sparsely-furnished–with long tables pushed together & folding chairs— basement lighted with gas lamps). The kitchen down there seemed well appointed with beautiful cabinetry, but didn’t seem ostentatious. I’ll pay more attention to what’s been mentioned here when on my next Shipshewana tour in Sept. A very thought-provoking post. Alice Mary I’ve been there or to one similar.It didn’t look like your typical Amish home even for Shipshe area. I have friends out there and have been to there homes. Any of the Amish I know from the Coldwater area would disclaim ANY connection with the “worldly” (their term) Amish from LaGrange/Elkhart Co. I do believe there is a settlement SW of Coldwater that is more affiliated with the Lagrange settlement. Also, are there other areas besides California/Metz where the womem wear black capps? Ours have one ready for a newborn girl–it is on her before any one else sees her. No, they don’t know it will be a girl, they are just ready. I know the Swiss in some other areas wear white. These are some interesting comments going back and forth on here. It’s an interesting topic. CoreVee, if I’m right, the only Amish (that I know of) where only black caps are worn by women are Swiss Amish who live in the Berne, Ind., community or settlements that originate from Berne. The Swiss Amish of Allen Co. and Daviess Co., or Milverton, Ont., wear white or black depending on occasion or married or single. Wow, Eric! One of your comments did not show up on my feed until today, and it was made early in the week! I have refreshed several times during the week, and this time it came through. My nearest settlement is definitely not Swartwentruber. It was started by 3 brothers from Berne(strangely by the name of Schwartz!) This was in the 1950’s. I eventually met all 3 and knew 2 of them well. I drove their Bishop many times for medical treatments. But my close Swiss friend from there said they are not Swartzentrubers, and she considers that group to be more restrictive, almost oppressive. She said the little girls can only have a doll that is not just faceless, but is an arrangement of tied cloth, not even sewed. And the women can’t even have a James washer. The Swiss settlement I know is centered on Hamman road. They have some ties with the Quincy settlement. I know one elderly woman has a sister in the other settlement, but I think both came via Missouri!The California (Hamman Road) settlement now has 8 districts. They have scattered west as far as Kinderhook. They sometimes visit the Camden MI settlement, and more often the Metz IN settlement. And Berne, of course!!! Thanks for letting me know CoraVee. Just so I understand, by comment feed do you meant the email that lets you know a new comment has been posted to a certain post? Sorry for the delay, it might have been due to the thing I was testing which I mentioned on another thread. That group you describe sounds very plain. I wonder how they wash clothes in that community. Thanks for all the interesting info about Amish in your area, if we have a question we’ll know who to ask 🙂 .